It's been a while since I did a freebie pattern, don't you think? This chunky hat was inspired by our many trips to a beach town nearby. I love it there no matter what the season but, my goodness, the wind doesn't half go through you for about 10 months out of 12! A super-warm hat was needed, the kind you can pull right down over your ears. And, at this dismally dark time of year, you do need a bit of colour to go with the grey too, of course. The Lomma hat uses the in-the-round version of the Woven Shell stitch. Written instructions for this variation are given below, but you can also find a step-by-step photo tutorial of the flat version here. It's one of those stitches that takes a little practice at first, but which grows quickly once you get the hang of it. It's a very speedy little make and, as you can see from the photos, I ended up with a nice stack to give away this Christmas! While we're talking of giving, there's something I'd like you to consider doing in return for this free pattern. Not for me, but for the thousands of people for whom this time of year isn't necessarily filled with joy and gifts. It would be wonderful if you could make a donation to a charity of your choosing for, say, about €4.00 ($4.00 / £3.35) - the amount I usually charge for a paid pattern - or whatever you can afford. My own charity of choice is Medecins Sans Frontieres, whose medics deliver (often at great personal risk) emergency aid to people affected by armed conflict, epidemics, healthcare exclusion and natural or man-made disasters. You can find the link for making a donation from wherever you are here: http://www.msf.org/en/donate. You don't have to, of course, but if you do - thank you! Any aran weight wool, such as alpaca, merino or other sheep’s wool will work well for this design. This hat is designed to fit snugly, with up to 5cm/2” negative ease. The brim is very stretchy. Check your gauge to ensure the right fit. Between sizes? 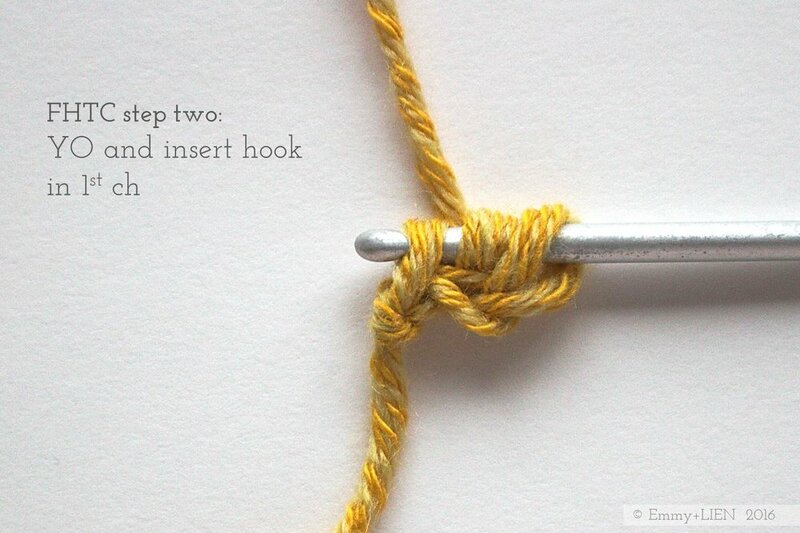 Follow instructions for the larger size, but go down half a hook size for the brim. Row 1: Skip 6. Working into the 7th ch, TC 3, ch 3. Going backwards, skip 1, then TC 3 in the 5th ch. *Going forwards again, skip 1 from the first 3-TC group and TC 1. Skip 3, TC 3 in the next st, ch 3. Going backwards, skip 1, TC 3. Repeat from * until 2 sts remain. TC 1 in the last ch. Turn. Row 2: Ch 3 (counts as 1 TC), then TC 3 in the same st. DC 1 around the top of the ch 3 of the woven shell underneath. Skip the whole of the next 3-TC group, then TC 3 in the second (i.e. middle) TC of the next 3-TC group. Ch 3, then go back and TC 3 into the second (i.e. middle) TC of the 3-TC group just skipped to complete the Woven Shell. DC 1 around the top of the ch 3 of the woven shell underneath. Skip the whole of the next 3-TC group, then TC 3 in the second (i.e. middle) TC of the next 3-TC group. Ch 3, then go back and TC 3 into the second (i.e. middle) TC of the 3-TC group just skipped. DC 1 around the top of the ch 3 of the woven shell underneath. Skip the whole of the next 3-TC group, then TC 4 into the top of the turning chain of the previous row. Turn. Row 3: Ch 3 (counts as 1 TC), skip the whole of the 4-TC group, then TC 3 in the second TC of the next 3-TC group. Ch 3, then go back and TC 3 into the third TC of the 4-TC group just skipped. * DC 1 around the top of the ch 3 of the woven shell underneath. Skip the whole of the next 3-TC group, then TC 3 in the second TC of the next 3-TC group. Ch 3, then go back and TC 3 into the second TC of the 3-TC group just skipped. Repeat from * until last st. TC 1 in the last ch 1 space. Repeat rows 2 and 3 until 6 rows in total have been worked. This hat is worked in the round from the bottom up. 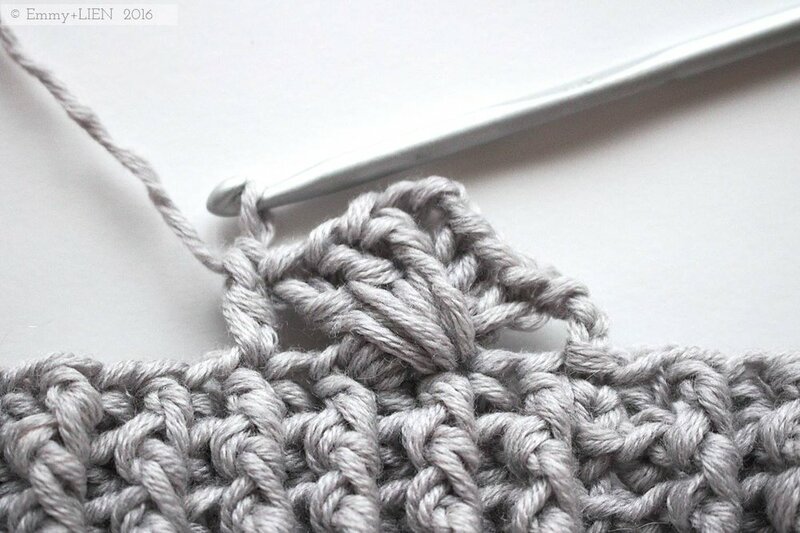 Join up each round with a slip stitch. Starting chains at the beginning of each brim round do not count as stitches. Do not cut colours not needed for next round. After joining with a sl st, sl st into the next st, pull up a tall loop and pass ball of yarn through, pull tight and leave on the inside until needed again. With C1, FHTC 48 (54, 60, 72, 78). Join for working in the round with a sl st into the BLO of the 2nd ch, taking care not to twist the work. Rnd 1: ch 2, *FPTC 1 , BPTC 1; rep from * around. Join. Rep rnd 1 another 4 (5, 5, 4, 4) times, joining to the first FPTC on the last round. WS set-up rnd: With C2, ch 3, *skip 3, TC 3 in the next st, ch 3, skip 1 going backwards, TC 3 around 1st 3-TC group in next st, skip 1 from 1st 3-TC group, TC 1 in next st; rep from * around. Join last shell to 3rd ch with a sl st.
Next round: With C3, SCDC around 3-ch above seam. *Skip the whole of the next 3-TC group, then TC 3 in the second (i.e. middle) TC of the next 3-TC group. Ch 3, then go back and TC 3 into the second (i.e. middle) TC of the 3-TC group just skipped. DC 1 around 3-ch; rep from * around. Join last shell to SCDC with a sl st.
Next rnd: rep previous rnd with C2. Rep last 2 rnds until a total of 5 (6, 7, 9, 10) rnds of WS have been worked, inc. set-up rnd. Cut yarn, leaving a 20 cm/8” tail for sewing. Thread tail through wool needle and pass through every 3-ch gap. Pull tight to close and weave in on the inside. Weave in remaining ends. 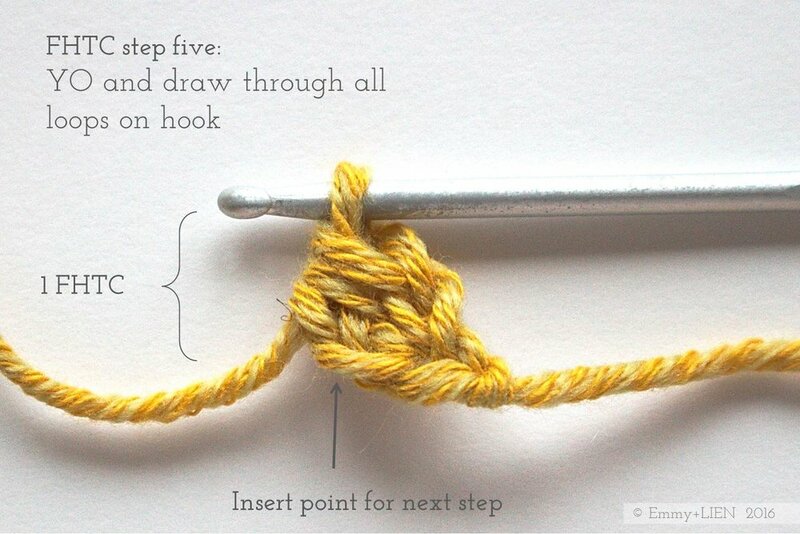 If desired, make a pompom using your method of choice and sew onto the top of the hat. Easy once you get going right? Although if you do get stuck, you're always welcome to get in touch. Tag your finished makes #lommahat and #emmyandlien - I love to see them! You are welcome to sell any item made using this pattern, but please credit the designer, Eline Alcocer, at the point of sale.